For those struggling with experiences of psychosis, therapy can be beneficial and even life changing. However, there is no single type of therapy, and a great range and diversity of therapeutic approaches have been developed to help different individuals’ needs, which makes deciding which approach is most helpful for an individual not a straightforward choice. Personal Experiences of Psychological Therapy for Psychosis and Related Experiences uniquelypresents personal accounts of those who have received therapy for psychosis alongside professional clinical commentary on these therapies, giving multiple perspectives on what they involve and how they work. 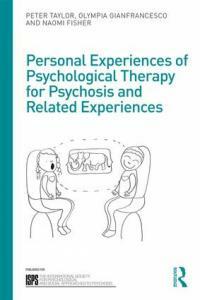 Presented in a clear and accessible way, each chapter includes accounts of a variety of different therapies, including cognitive behavioural therapy, trauma-focused therapy, open dialogue, and systemic family therapy. The reader is encouraged to explore not only the clinical basis for these therapies but also understand what the treatments mean for the person experiencing them, as well as their challenges and limitations. The book also explores the importance of the individual’s relationship with the therapist. As a whole, the perspectives presented here provide unique insight into a range of widely used psychological therapies for psychosis. With its special combination of personal experiences and concise introductions to different therapies, this book offers a valuable resource for academics and students of psychiatry, clinical psychology, psychotherapy, mental health care and mental health nursing. It will also be essential reading for those considering treatment, their friends and families, as well as mental health professionals, including psychiatrists, clinical psychologists, psychotherapists and nurses.